Designed to exceed the quality of the top private label hotel mattresses without breaking your account. The hotel series has been specially designed to satisfy many of the customers needs in luxury and comfort today. 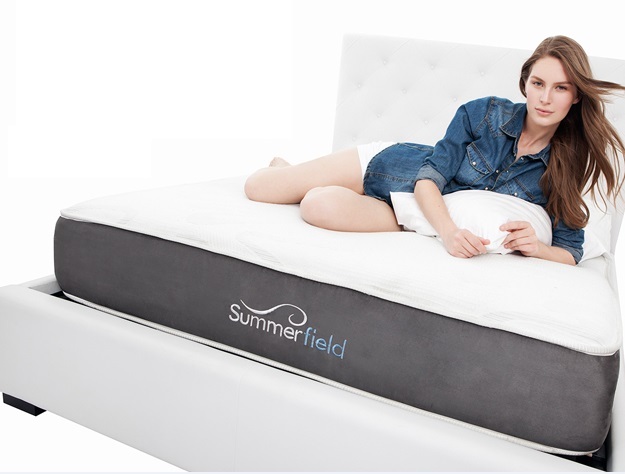 The Summerfield Gel Series is an all foam mattress collection designed with modern foam technology such as gel swirl memory foam with special accent custom foams such as latex to reduce pressure points, increase support and virtually eliminate motion transfer from one partner to the other. The Summerfield Fusion Mattress Series provides a cool sleeping environment with a luxurious supportive feel. 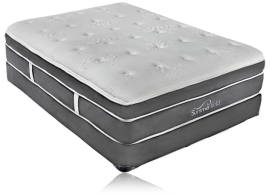 It is a combination of two proven comfort technologies that rate high with todays mattress users. The Summerfield Latex Series is designed to lift your body and relieve pressure at the same time without sinking in or transferring motion. 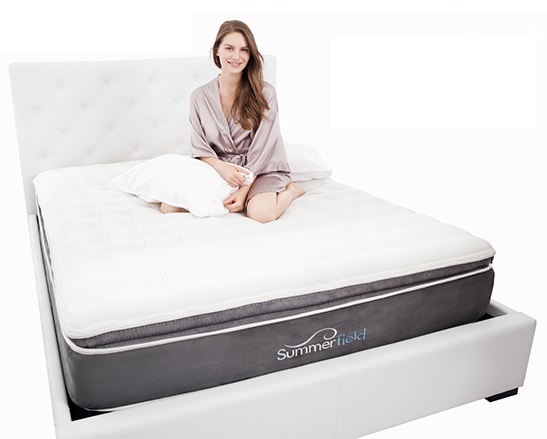 The Summerfield Traditional Two Sided Series was designed for all of the customers requesting a firm mattress the way mattresses used to be made, Two Sided and Tufted. If your are not impressed with all of the new features that the mattresses have today and yearn for a mattress that goes back to the basics than the traditional series may be your choice. 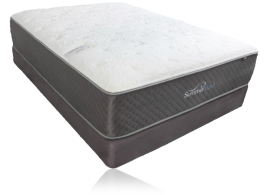 A Level 10 Extra Firm Mattress will generally have compressed padded foams on top and below the padded foams a very pressure resistant support base, comprised of a strong coil unit or blocks of dense rigid support foam. This illustration shows very little give and is the hardest mattress you can sleep on. Think of it has a floor with shock absorbing springs with a light foam top. 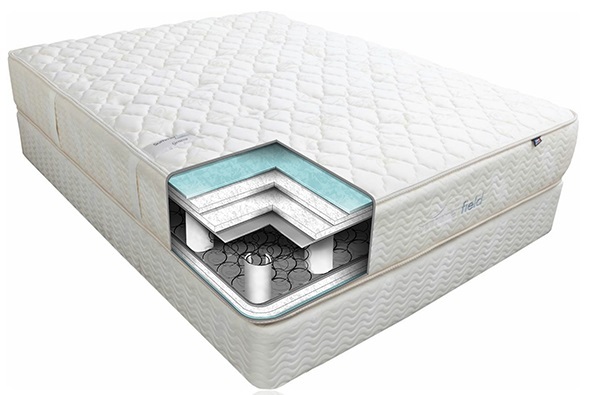 A Level 20 Firm Mattress will generally have a less compressed foam padded layer, more conformability and about 10% more cushion than an extra firm mattress. The coil or support foam base will generally be just as strong as an extra firm base with increased give in the padded layers and very little give in the base support system. The illustration shows very little give and is the second hardest mattress you can sleep on. A Level 30 Medium Firm or Luxury Mattress will generally have a less compressed foam padded layer, more conformability and about 10% more cushion than a firm mattress. The coil or support foam base will generally be just as strong as an extra firm base with increased give in the padded layers and very little give in the base support system. The illustration shows very little give and is the third hardest mattress you can sleep on. A Level 40 Plush Firm Mattress will generally have an increased height of layers of padded foam, more conformability and about 30% more cushion than a firm mattress. The coil or support foam base will generally be just as strong as an extra firm base with increased give in the padded layers and very little give in the base support system. The illustration shows very little give in the foam support layer with increased give in the top padded layers. One of the more popular choices for a back and stomach sleeper and a great compromise for a couple where one partner prefers a firm mattress and the other partner prefers prefers a medium cushy feel. 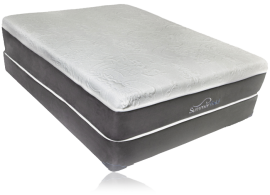 The rigid support layer should provide enough support to the partner that prefers a mattress with a firm base. A Level 50 Plush Mattress will generally have an increased height of layers of padded foam, more conformability and about 30% more cushion than a firm mattress. 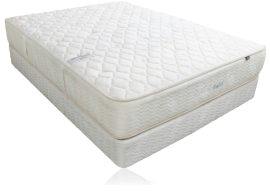 The coil or support foam base will have more give and conformability than the plush firm category giving the customer an increased combined softer feel than a mattress with a firm base. The illustration shows increased give in the foam support layer with increased give in the top padded layers as well. One of the more popular choices for a back and side sleeper and a great compromise for a couple where one partner prefers a medium firm mattress and the other partner prefers prefers a medium cushy feel. 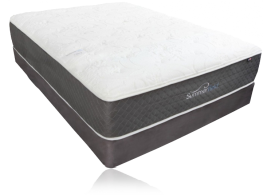 In addition we have found that the give in a mattress with a plush support base helps releave the pressure on womens hips who sleep on their side. A Level 60 Super Plush Firm Mattress will generally have more layers of padded foam, more conformability and about 30% more cushion than a typical plush mattress. The coil or support foam base will generally be just as strong as an extra firm base with increased give in the padded layers and very little give in the base support system. The illustration shows very little give in the foam support layer with increased give in the top padded layers. One of the more popular choices for a back sleeper that may also work just fine for a side sleeper as well. It is a great compromise for a couple where one partner prefers a plush firm mattress and the other partner prefers prefers a greater soft feel. A Level 70 Super Plush Mattress will have an increased height of layers of padded foam, more conformability and about 30% more cushion than a Plush mattress. 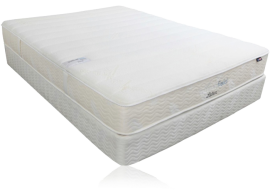 The coil or support foam base will generally have more give and conformability giving the customer an increased combined softer feel than a mattress with a firm base. The illustration shows increased give in the foam support layer with increased give in the top padded layers as well. 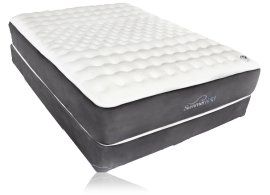 One of the more popular choices for a back and side sleeper and a great compromise for a couple where one partner prefers a plush mattress and the other partner prefers and even softer feel. 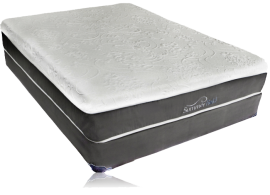 In addition we have found that the give in a mattress with a plush support base helps releave the pressure on womens hips who sleep on their side. Which is the Right Mattress for Me? You have probably already looked over our comfort guide which is designed to give you a basic understanding of comfort levels for mattresses. But you may still be wondering what is the right mattress for me? Below we will be writing about the rules of thumb about mattresses and which one may suit you the best. But before you dive in reading the rest of our article we want to make a statement. All of the rules or reccomendations that we suggest are based on a cross section of our customers feedback, opinions of doctors and other sleep professionals. These suggestions can be disregarded if you lay on a mattress that feels comfortable to you regardless of how you sleep. Our experiences says if you try something that feels comfortable than you are going to be a happy camper. At the same time if you lay on a mattress and it feels a little odd, chances are you will have a problem and you should try another model. That being said when you try a mattress in the store generally the mattress will already be broken in depending on how many people tried it out in the store. So when you get a brand new mattress at home it may take 1 to 4 weeks to get the same feel as it was in the store. People who often sleep on their side will probably do better with a range of (40)plush firm to a (70) super plush mattress. Why? Because when you sleep on your side you are putting focused pressure on your shoulders and hips. If you were to sleep on your side on a firm mattress you have a greater risk of creating pressure points on your shoulders and hips because your body will be absorbing the majority of the pressure. The extra foams on a plush mattress will help absorb the pressure area and transfer the pressure from the weight of your body into the foams of the mattress. Well imagine you had a 2 inch sponge and you put it on the floor and you rested your knee on it. Yes it would feel more comfortable to your knee than resting your knee on the floor surface directly but there would still be some discomfort and you would still feel the base of the floor as the spong compresses from your weight. Now take that same sponge and put another 5 inch sponge on top of the two inch sponge and rest your knee again. The pressure will be relieved and you will not have the feeling of having your knee pressing on the floor as the increased cushion will displace your weight better. People who sleep on their backs will generally find a level 30(Medium Firm), 40(Plush Firm) and a 60(Super Plush Firm) mattress the most comfortable. Also back sleepers can get away with other plush level mattresses depending on the health of their back. If the mattress feels super comfortable you will probably be ok with it no matter what the comfort feel. The above reccomendations are based on our average customer but there always people who do not fit the average user. 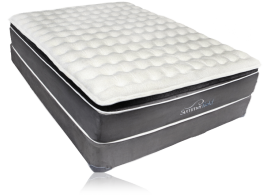 Why do we prefer a combination of plush top padded foam with a firm support base underneath? On any plush mattress you will feel support on your shoulder blades and your tail bone but some where in the middle of your back you may not get the proper support because a mattress with a plush base may not give you enough push back support. Push back support can come from a firm pocketed coil support or a firm support foam base. 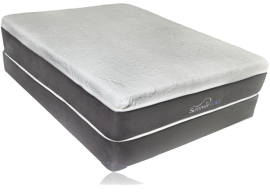 The push back from a firm support base will help compact the padded foams of the mattress into middle of the back. A plush support base may not give enough push back in the middle of the back Possibly causing the muscles in your back to work harder leading to stiffening of the back. People who sleep on their stomachs will quite often enjoy a level 10 (Extra Firm) to a level 40(Plush Firm) ) (a level 60 Super Plush Firm will be pushing it). Why not recommend something softer? Because when you sleep depending your weight you will form a U shape laying on your stomach in the mattress. Your stomach will generally sink in more putting extra pressure on your lower back which can possibly lead to stiffness. If you do like soft layers we recommend at least having a firm coil support or foam base lessening the body from curving and keeping your back better aligned. When selecting a pillow please choose a pillow that will not dramtically increase the upward curve of your body in the mattress. 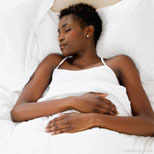 Sleep Advice: Trouble Sleeping Still? Ok so now you have the mattress of your dreams and the perfect pillow and you still can’t get a good night’s sleep. The Secret To Sleeping: Be Satisfied At The End Of The Day No Matter What And Be Appreciative Of Whatever You Have In Life. No matter what your life situation is there is always someone who is worse off than yourself. There is always someone who wishes their life would be as good as the next fellow. I can tell you from speaking to people across the country, no matter how rich or poor, no matter how tall or short, no matter how athletic or unathletic, no matter how intelligent or less intelligent, no matter how healthy or not healthy each person in life feels they have challenges and stresses during the day that are difficult to manage. I can also tell you that the happiest people I have encountered are the ones that are satisfied and appreciative of wherever they are in life. Now some readers may find this concept a little hokey but I believe this is the truth. No matter what, at the end of the day be satisfied. During the day be fearless on attaining any life goal you have whether it is getting that promotion, leaving your job for a better one, starting your own business, doing charity work, being the best parent or grandparent....Try to accomplish whatever it is that you feel will make you happier. Even a sports team can be satisfied in a loss as long as they know they gave it everything they had, they can still find achievements and positives in a loss. Whatever it is fight like hell during the day to achieve it! But at night when you go home put the days events to rest and close your eyes and take in every positive experience that you have and be satisfied. The night is for Recovering and the day is for Accomplishing your daily tasks and goals. Think of what you have already accomplished in life no matter how insignificant you may think it is and take in those thoughts and clear your mind. Separate the accompishing part of the day from your recovering time at night. 1. Try not to eat three hours before you go to sleep, it is well documented that eating food late at night will stimulate your body which is not what you want to do before you sleep. 2. Cut back on the caffeine intake during the day. At night the caffeine intake will catch up on you making it difficult to sleep. 3. Drink more water than sugar or products with artificial sweetners in it during the day. The chemicals in all of those sugar and low calorie drinks will contribute to sleeping problems at night. 5. Don't play video games two hours before you sleep. Again this is known to give adults and children a wired effect making it difficult to fall asleep. 6. Stretch for at least 10 minutes a day. As we get older our muscles are getting tighter contributing to minor aches and pains we all get. You will be surprised at how many of your aches dissapear after stretching regularly helping you to sleep better at night. 7. Exercise but do not exercise three hours before you go to bed as this may stimulate your body making it difficult to sleep. 8. This is the most difficult one for me...Do not fall asleep with the tv on. Many studies show that having a tv on before going to bed for starters will make it more difficult for you to fall asleep. In addition many studies show that to achieve REM sleep which is the highest state of rest, a person should be sleeping in the darkest quitest room. Achieving a deep Rem Sleep is critical to everyones health as our muscles and organs attain the highest level of recovery during REM sleep. Studies show that the light and sound produced by your average television may prevent you from reaching REM sleep. If you must have the tv on, than please use a timer, many tv's come with a sleep feature that will shut off the tv after a set time that you can program. If there is no timer feature you can buy a timer from a local hardware store that will shut the tv off. 9. This may be unncessary for most readers but keep your bedroom clean, uncluttered and organized. You want your bedroom to feel like an oasis. Your own little paradise, decorate it in a way that will give you a positive vibe when it is time to go to sleep. 10. Grandma's Tip: My Grandmother Anita loved giving advice and one of the more memorable tips she gave me was after a long stressful day to take a long hot bath to get relaxed and to separate the days events from the evening. I find that when I personally have trouble sleeping that this helps the most. Well that’s it for now. If any customers want to add a suggestion to the list please email us with it.